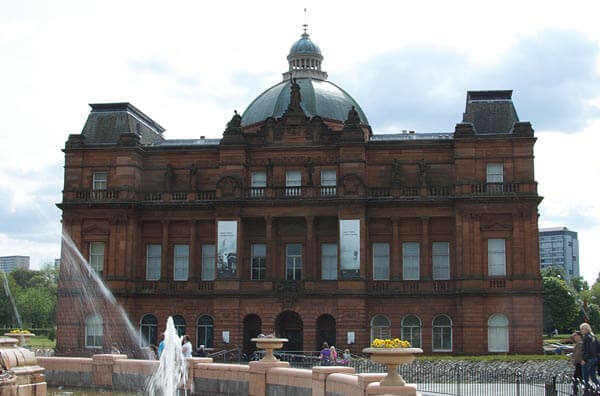 Located on Glasgow Green in Glasgow, Scotland, the People’s Palace is a museum dedicated to the city’s social history from 1750 to the present. It is a lovely three-story stone building built in 1898, which is fronted by the world’s largest terracotta fountain at forty-six feet high and seventy feet wide. It is called the Doulton Fountain in honor of its donor, Sir Henry Doulton, a pottery manufacturer who founded The Royal Doulton Company. The building was constructed specifically in the poor, overcrowded, working-class east end of the city because it was meant to serve as a cultural center for the people there. One of the exhibits now portrays the typical one-room tenement many residents resided in during the Nineteenth Century, along with how they did their wash in a communal laundry and how they spent their leisure time on paddlewheel steamers going down the Firth of Clyde or dancing at the local ballroom, The Barrowlands. The museum is interesting for visitors of all ages, with its many film clips and computer interactive displays. There are paintings, historic artifacts and photographs depicting how former Glaswegians lived during struggles with the trade unions, the war and former every-day life in the city. The museum’s conservatory, the Winter Gardens, is located in the back of the ground floor. This winter garden is pleasing to the eye and a pleasant way to spend some time relaxing or having something to eat among the tropical foliage. Monday CLOSED, Tuesday to Thursday and Saturday 10am–5pm, Friday and Sunday 11am–5pm. Last updated by Ginny on 12 December, 2012 in Destinations.